Marshall Hugh and The Marshall Law Band debut "A Hero's Journey: The Hip-Opera"
SEATTLE - Nov. 8, 2018 - PRLog -- Seattle-based poet, playwright and leader of Marshall Law Band, hip hop artist Marshall Hugh, breaks new ground with a "A Hero's Journey: The Hip-Opera" which premieres at the Carco Theatre in South Seattle on November 16 and 17, 2018 along with the band's debut EP, "Nostos: A Hero's Journey." Inspired by Homer's Odyssey, Gilgamesh and other classic literature, Hugh wanted to create an alternative to formulaic hip hop music that would stand out from what is becoming an increasingly crowded hip hop scene in the greater Seattle area. Hugh, who conceived and wrote this Hip-Opera, is recognized as an up and coming poetic voice in the growing Seattle area hip hop community. "In a time where saturation is at an all-time high, I questioned how The Marshall Law Band wants to be remembered as artists? This was the impetus for creating a fresh experience with a modern-day opera that speaks to the experiences of young people today." Hugh started a year-long writing process in 2017 by immersing himself in classic literature. He discovered that he strongly identified with the archetype of the Hero's Journey which also inspired the name of the EP: Nostos. Nostos is a theme used in Greek literature which includes an epic hero returning home. 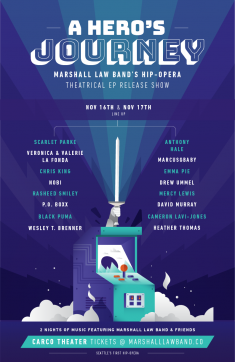 The cast for this first run of Hugh's Hip-Opera includes all the members of the Marshall Law Band plus other young artists making real strides in Seattle and beyond including Scarlet Parke, Valerie and Veronica Topacio of La Fonda, Chris King and more. Audience members will receive annotated lyrics for the rap songs. "The cadence and pace of hip hop songs can be tough to understand. I want people to see the words clearly as well as the arrangement of the words," said Hugh. The EP was recorded primarily at Seattle's legendary Robert Lang Studio and features four lyrically deep tracks filled with funk and hip hop fusion. A 2018 City of Seattle Arts grant helped support the creation of the Opera. Chuck Roxin, managing partner of Patron Saint Arts Management was instrumental in bringing The Hip-Opera to the stage. The production also received promotional support from 4Culture, the cultural funding agency for King County, Washington. In support of exposing disadvantaged youth to the arts, Hugh is offering free tickets to organizations supporting at-risk youth or offering services to children in foster care including TeenTix, Federal Way's Multi-Service Center, MoPOP and Treehouse. The Carco Theatre is located at 1717, Maple Valley Hwy, Renton, WA 98057. MC/Poet/Playwriter, Marshall Hugh, 26, has been actively creating music/performing in the Seattle area since 2013. Up until 2016, Marshall was a solo artist under the moniker Marshall Mung. To support the creation of his debut solo album "Mill Creek" in 2015, Marshall had pooled together a band of musicians. He found the energy of playing with other musicians so intoxicating that by the beginning of 2017, the name Marshall Law Band was in place and the band embarked on a rigorous show campaign in 2018. Marshall Hugh and his Marshall Law Band have played over 40+ shows in 2018 and are finally set to debut the Hero's Journey, a Hip-Opera. WATCH: Phase 1 - Head Nod is a recap of the band's first 9 months of 2018 playing shows together set to the tune of their debut single, "Head Nod". Film festival acclaim grows for locally produced music video, "We Shall Not Be Moved"